This is my illusory image…the projection of myself. A paradox within the very masquerade I portray. I am not that which you think you see when you look at me. Quite the contrary…I am that which I choose to see. Reflection’s surreality is the lie. If you look with intent…truly discerning in your journey to discovery of what is or is not real. Then your rewards will be enlightenment, illumination, understanding. Even more so…you will see what I see…beyond the façade…the charade built over the years of life’s trials and tribulations…The interpretation of faux projection bearing no semblance of truth. 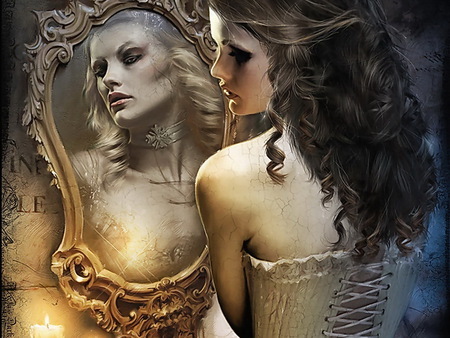 You will see so far beyond the layers of lie…so as to truly see yourself when you look into me…your mirror. You can not be here…. Dare I risk tempestuous temptation? Just because you choose not to see. Everyone has hard choices to make.. Ignoring of the casualties of cruelty..
Knowing in your heart it was wrong..